You Will Spend Your Christmas With Electrick Sages? Something in the vibrational energy of psychedelic rock shifted somewhere around New Year's 1968. Or maybe it's a more prosaic deluge of influences flowing in. Anyway, in 1967 it seemed perfectly acceptable to put all your vim and vigor into a startling slab of psychedelic pop - big league hitters like "See Emily Play" and "Strawberry Fields Forever" typify this. Then 1968 rolled around and suddenly you couldn't just be poppy without being relegated to the world of bubblegum. You had to let in that early heavy metal/electric blooze crunch or get more country (folk was admittedly a key feature of prime psychedelic pop). I guess it worked out ok for the Grateful Dead, but it counter-intuitively painted a bland streak over other acts. Of course, I like "Who's Next," "L.A. Woman," and "Abbey Road," but I'll never dig them as much as "The Who Sell Out," "Strange Days," and "Sgt. Pepper." That 1967 never really seemed to reemerge as far as I can tell until the late 90's, when Elephant Six made its mark. While it was very groovy stuff, it was also far more low budget and indie. We've got Andwella's Dream creeping out in 1969, with a foot planted in both dynamics. Much of the songwriting does harken back to psychedelic pop, but they have the makings of a hard rock backbone (even when they are often mellow) and the vocal bombast of a Traffic-era Steve Winwood or post-"Tommy" Roger Daltrey. If you are looking for that pop groove, "Sunday" and "High on a Mountain" do a pretty spiffy job of honing on that. On the other side of the coin, opener "The Days Grew Longer for Love" could get tossed onto side B of Traffic's self-titled album without anyone batting much of an eye and the ballad "Andwella" actual works up a pretty heavy metal head of steam for a few moments. "Midday Sun" gets into the softer side of Dylan. I feel like people usually go for the nasally invasive, ranting vibe when they get Dylan-esque. Meanwhile "Lost a Number, Found a Kite" looks like a psychedelic epic if you look at the track time, but really it's just a tune with half the time a rambling intro. So, middle of the road? Pretty much. But it's got some very nice craft with groovy production and sticks its head up above the sun enough times to take notice. Let me throw in one caveat. If you absolutely love the first couple Traffic album and prime Procol Harem, this is directly up your alley and you will like this much more than my rating suggests. I can see where someone would really dig all of this stuff. 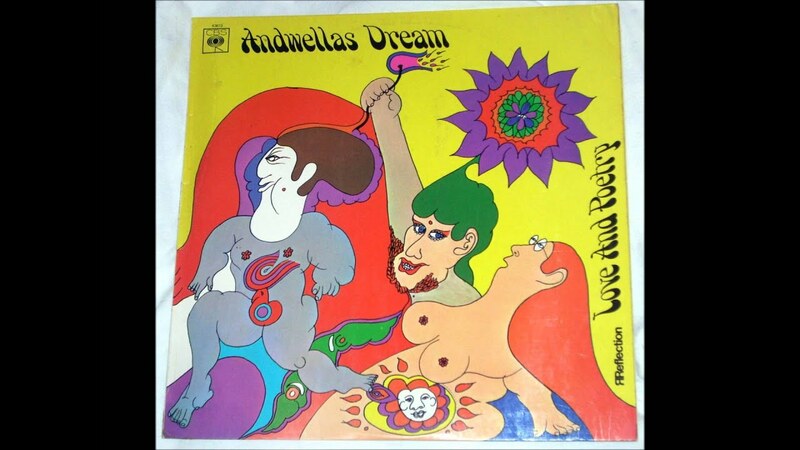 I've made concerted efforts to get into that bubble understanding that there is a worthwhile headspace to work your way into, but I've found that Traffic, Procol Harem, and now Andwella's Dream only hit about half of my pleasure buttons for whatever reason. Let me set it down straight for you. We are not looking for wealth, although a bit of coin would obviously be nice. We are certainly not looking for fame. That doesn't look like a nice paradigm. We are looking for your ears, though. We are trying to speak to your soul, that etheric energy that you can feel when you pay attention to those breaths in and out. These are the sounds of the Electrick Sages. The sound is electronically-infused art rock with echoes of plastic soul Bowie, post-punk Joy Division, and Berlin School drones. The purpose is to assist You in your conscious evolution. Maybe you are starting on your way to seeing the true fabric of reality. Maybe you have already awakened. This is music to engroovy your spirit. Who are we? An American and an Australian – we are both living in Japan. We have taken up a position outside the bubble and are bringing back insights. Who were we? We were Glaze of Cathexis, and brought you visionary psychedelic rock. We were Damaged Tape - warping electronic sound to enlightening vibrations. And now, we want to vibrate higher and bring you along with us. We are the Electrick Sages. We are going to take you higher. We are not priests or cult leaders – we extol no religion. We are not psychics – we know not what the future brings, only the present. We are not philosophers – we have moved past that, into pure feeling. This is the satori experience of "one hand clapping." And, we are not charlatans – we are abstract but bring to you truth as we feel it. We are sages – we are musical seers, peering into the prismatic abyss and reporting back to you exactly what you need to know. This is not religion. This is not a cult. This is a pure expression of Spirit, taking you past the coarse physical plane and launching you off into the refined astral. Trip with us. Spread the word on the Electrick Sages.